As the New York City subway system hurdles toward complete destruction, state leaders are cooking up some creative solutions. You see, allocating emergency relief toward the trains would be too easy. Exhibit A: Metropolitan Transportation Authority chairman Joe Lhota said he’s considering banning certain food from the trains to improve the system. Lhota got the idea during a train ride when he saw some NYC commoner chomping on Chinese food. Probably ravenous from waiting 50 minutes for a train, the eating man paid no mind to the egg fried rice flying out of his mouth and the container, onto Lhota’s shoes. Why not just put more trash cans at stops? Well, duh, because having trash cans at stops encourages people to put garbage into the cans instead of carrying their trash onto the trains all the way home to their personal composts or recycled-material craft art. At least that’s what Lhota thought when he removed trash bins from stops to reduced garbage pileup, until the MTA nixed the plan realizing it was the world’s stupidest idea in the history of stupid ideas. Lhota seems a little confused by how garbage works. We’ll let him be for now. 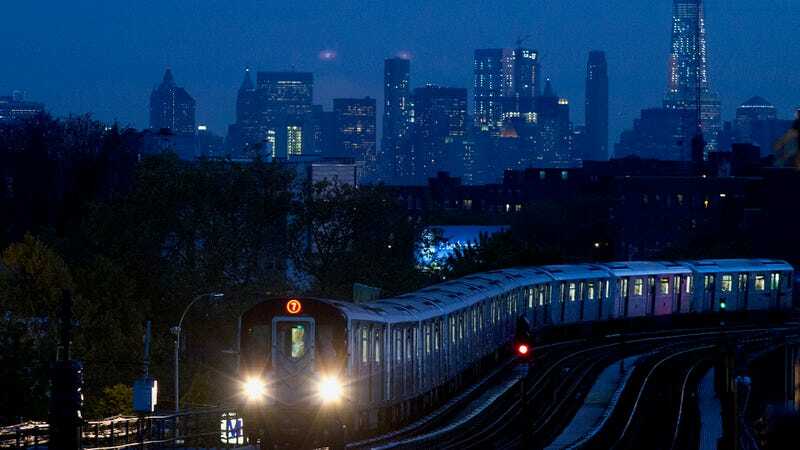 Governor Andrew Cuomo, meanwhile, thought since the MTA was rolling in dough, he could allocate hundreds of millions of its funds to building bridge lights. And not just any bridge lights; decorative, LED lights for seven MTA bridges and two tunnels that provide coordinated light shows in an off chance the Mets win the world series. You think I’m being sarcastic, but I’m not. Cuomo officials say that the $216 million is simply a placeholder estimate for the project. Weinstein said he does not know the exact cost but it is “nowhere near” the $350 million estimate. Cuomo spokesman Jon Weinstein told POLITICO the MTA would “definitely NOT” pay for the light shows, but the governor joked last October that then-MTA chairman Tom Prendergast has the funding “in his back pocket,” The Village Voice reports. This all is to say the people that run the subway system have no idea how to run a crumbling subway system, and that one day you’ll be in a stalled above-ground subway train, Chinese food in hand, watching the Brooklyn Bridge turn from orange to pink, and be very, very sad.